CivilizationEgypt, Coptic, 400 C.E. – 500 C.E. ProvenanceFormerly Coll. Eduard Schällibaum, 1950’s-60’s, Chur. Woven Tabula and Clavus of a Tunic. Two-colour tapestry in silhouette style, fine-threaded, purple and beige,red wool for the cord. 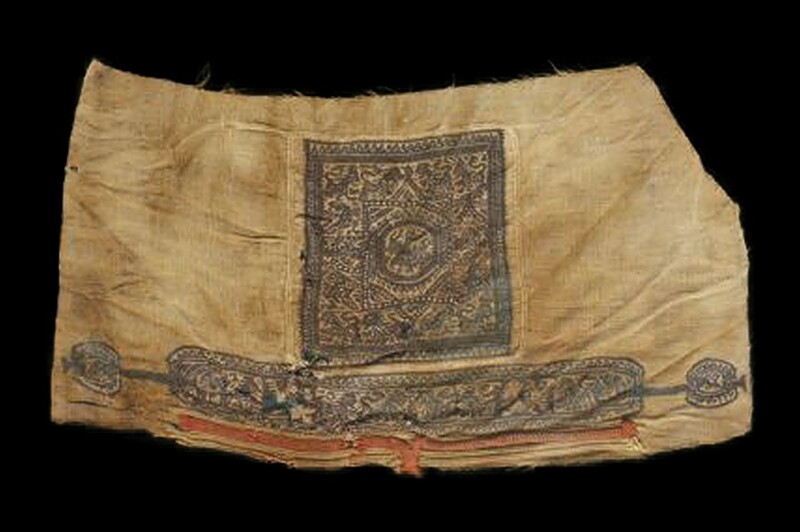 Large fragment of a tunic with a) TABULA WITH TONDO AND LION FRIEZE. – Central tondo with fishes and mythical creatures on a beige ground inside two rectangular frames, the inner one positioned at an angle to the outer one. On opposite sides a human head; on the two other sides a wide lion frieze with plenty of filler elements as frame. “Running dog” or fringed border as frame. b) CLAVUS WITH LION FRIEZE. – Continuation of the lion frieze in a) on a beige ground and with the same frame. Half oval at each end with a “pompom” containing winged creatures attached to it. Cord braided from red wool running parallel to the band. cf. Cat. Leipzig – 2002, 114 ff., nos. 160–165, 172 with illus. On the application of the elements on a tunic, cf. Effenberger – 1976, 216 f.